Beginning in late 1907, Braque and his new acquaintance Pablo Picasso began to paint objects as highly simplified geometric forms, expressing solidarity with the most idiosyncratic tendencies in the art of Cézanne—especially that of putting together unaligned observations of adjacent parts. Matisse, whose own works at this time emphasized rich color, is generally credited with coining the term “Cubism”—and he used it to describe Braque’s overcast landscapes and shadowy still lifes. 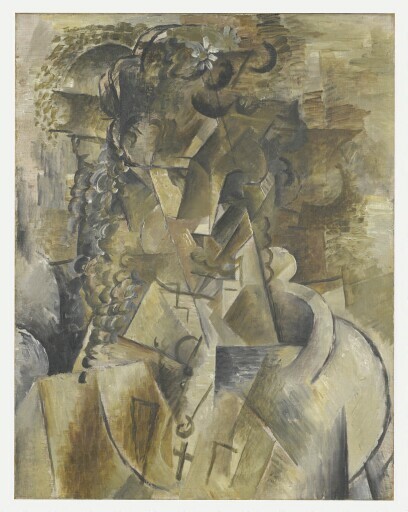 By late 1909, however, Braque and Picasso had extended the Cubist premise to such a degree of analysis by fragmentation that their somber gray and ocher paintings appeared mostly abstract, except for scattered, geometric-shaped vestiges of recognizable imagery—an eye, the bridge of a nose, a cascade of hair in curls, or a necklace with a cross. The implication was that solid matter and the space surrounding it had interpenetrated one another, resulting in a new visual order. In Girl with a Cross, the head (or rather its disembodied details) emerges like an apparition amid a rich interplay of highlighted and shaded facets, thinly scumbled and atmospheric in mood. What appears to be a round white ceramic pot at the right, more solidly painted than the woman, mysteriously occupies the space where her shoulder should be. Orchestrating details in this way, Braque creates an unprecedented visual impression of presence, absence, and movement, all dissolved together into a single space-time diagram. (Daniel-Henry Kahnweiler [25 June 1884-11 January 1979], Paris). (César Mange de Hauke, Paris and New York) [8 March 1900-1965] by 1947.
purchased by Kimbell Art Foundation, Fort Worth 1989.